Funny Cat on a Sheep Video. You will enjoy a funny cat on a sheep. 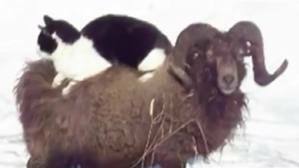 The Funny cat likes to walk around sitting on a fluffy sheep. So cute! It seems she in enjoying the ride on the sheep. Looks so happy! Enjoy the video. One is for sure, that will see and enjoy this Funny Cat on a Sheep video again and again!